The first moments after a car accident can be overwhelming, but it’s important to keep calm. The trauma and excitement (not the good kind) of an accident is unexpected and hopefully rare. Your car is damaged, sometimes a total loss, and you may also be dealing with the physical and emotional trauma of bodily injury. If you wish to be adequately compensated for your vehicle damage and your injuries, the steps you take shortly after the accident can be vital in any insurance settlement or at trial. Having the guiding hand of an attorney through the process will bring you peace of mind that you are doing everything you can. Call the Police: After the accident has occurred, call the police. Beyond issuing a ticket or summons for the party at fault, the police will typically complete and file an accident report. This report may prove essential in determining who is civilly liable (at fault) in the accident. Virginia is a contributory negligence state — this means that if the injured party is found to have contributed to the accident in any way the other party is not legally responsible at all. An accident report can help you or your attorney determine if the other party’s liability is clear. Call Your Insurance Company: The reason you have insurance is exactly for moments like these. Depending on your level of insurance you may be entitled to the costs of repairs or replacement of the vehicle, a rental car, and even medical expense reimbursement (notwithstanding who was at fault). It is important you review the Declarations Page provided to you by your insurance company to see the extent of your coverage. Seek Medical Attention: Depending on the severity of your injuries, this may be the first step to take. Even if you do not think your injuries are serious, frequently in car accidents they worsen dramatically in the hours or days after the accident. The longer you wait to seek medical attention the more difficult it may become to relate the medical care to the accident (in the event you choose to make a bodily injury claim). Get Witness Information: If there are witnesses to the accident, obtain their contact information and a brief description of what they saw or heard. Take Photographs: Take photographs of the damage to your vehicle. Photographs at the time of the accident can be crucial in determining liability. Photographs of any visible injuries on your body are also helpful in showing their nature and severity. Keep a Medical Diary: We frequently encourage our clients to keep a diary of their injuries and medical treatment. Often, the process of settling a claim can take months depending on the extent of the injuries and the treatment required. Documentation of a client’s treatment and progress can help the attorney in evaluating and ultimately resolving their client’s claim. Not all car accidents will require the assistance of an attorney. We can help you evaluate your claim and be upfront with you as to whether you will need the assistance of counsel. 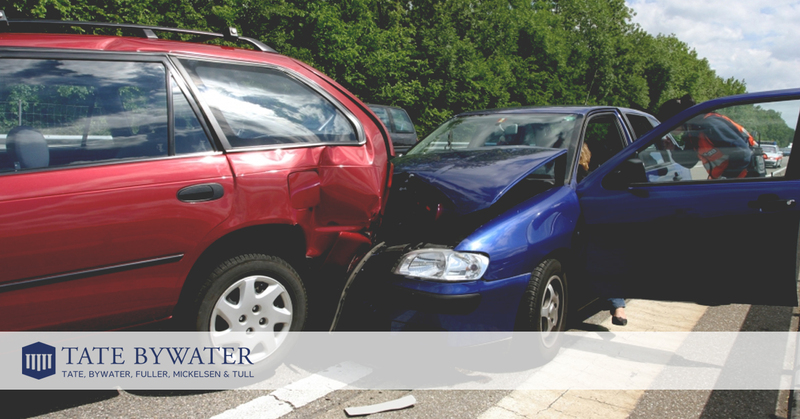 If you have been injured in an accident, contact the attorneys at TATE BYWATER at 703-938-5100 for a free consultation.